Li Pao Fu Industrial Co., Ltd. was founded in 1993, backed by machinery production, plastic injection molding and product R&D departments. The company initially focused on making, selling plastic products in the domestic market, then gradually ventured into developing and manufacturing auto accessories and computer peripherals for export. This versatile manufacturer has over the years built a sound reputation among buyers from all over the world. To build higher profile and secure sustainable growth, the firm has branched into developing eco-friendly electric vehicles over the past years, with several models already launched to meet various commercial applications to enjoy solid reputation in the market. Some of its popular e-vehicles that have been developed to meet extensive demand in commercial premises as office, malls as well as factories include electric carts for carrying goods in clean rooms in electronic plants, for ferrying managers on supervisory rounds to save time and labor, for carrying visitors on factory tours to also enhance corporate image. E-vehicles play a significant role to reduce energy use, cut operating cost, raise efficiency, quality of work setting to be eco-friendly with minimal maintenance. Besides pursuing commercial interests, this maker is also committed to developing e-vehicles that are in tune to the current eco-consciousness being encouraged in especially developed nations, and to introduce eco-friendly vehicles to help reduce energy use, greenhouse gas emissions, noise and pollutants. Additionally, the company also supplies automatic rice milling equipment (like automatic rice weighing and packaging machine) to many domestic rice milling plants to be well known in the local rice milling market. 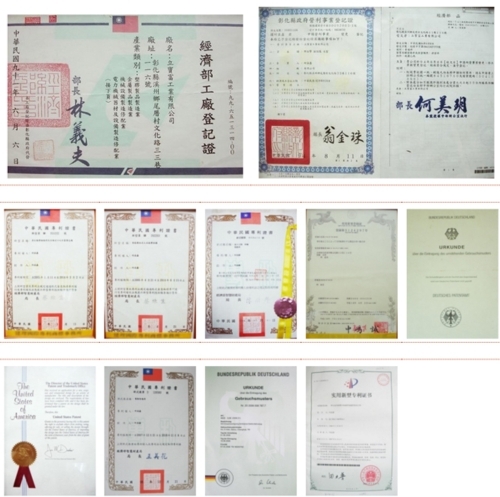 Its machines are multi-patented in Taiwan and overseas to confirm its innovation without intellectual property copying. The versatile manufacturer is also diversifying into designing and marketing various decorations for interior and outdoor home settings, having developed a series of K/D trellises or floral racks that can be integrated with free-standing or floor lamps to meet rising demand. Driving Li Pao Fu’s continual growth is the firm’s emphasis on quality and service, which the maker promises to bring to buyers to build profitable business, with the line of quality products certainly to enhance life quality for end-users. This conveyor is to load and unload goods in factories, and can be customized for overall length, width and inter-roller gap according to particular work setting and floor layout. This trolley can be used as a part of transport line to convey small-packed grains as rice in rice mills to enhance work efficiency, lower cost and improve overall production process, also being suitable for conveying goods among factories, with the trolley’s length, width and inter-roller gap customizable according to specs. Typical roadside warning triangles must be placed 50M~100M behind a vehicle with limited visibility. But this warning device can be hung on a vehicle window or placed on rooftop to drastically enhance early warning to oncoming drivers, being especially effective in bad weather.